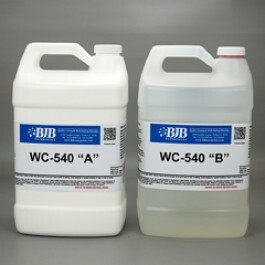 WC-540 A/B is a two-part, water clear, colorless aliphatic based polyurethane elastomer. It is recommended for use whenever a flexible, permanently transparent elastomer is required. It can be easily tinted or pigmented to clean bright colors. WC-540 A/B does not contain MOCA, TDI or MDA. In addition to being an excellent castable product, it also functions well as a solvent-free adhesive for bonding various substrates. Silicone Molds: Platinum based silicones are recommended for molds. Tin based silicones may cause cure inhibition. For more info, contact our Tech Dept.